You are here: Home>Topics>The Tuam Herald>Where I grew up, we had our own Cheltenham Festival of Racing! DOWN MEMORY LANE..to an earlier time and a different venue: Milltown Races 1915, near Sheridan's Shop & Pub. 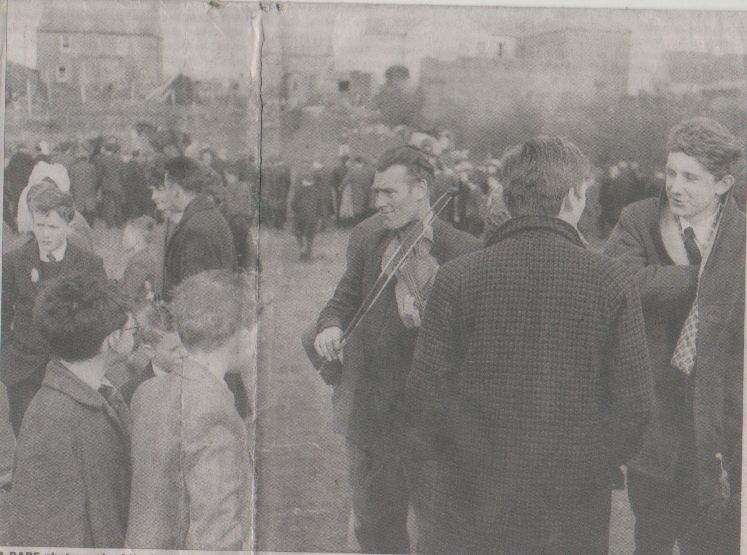 A RARE photograph of the legendary fiddle player Paddy Rainey, taken at Milltown Races. There is a Rainey family (Paddy, Stephen and Bridie) traditional music CD available, from an original recording in a Connemara pub in 1956. The Raineys were a family of Galway travellers who spent their summers in the Letterfrack area and their winters in North-East Galway. They were recorded while in Connemara by Professor Tony Knowland, an authority on WB Yeats and passionately interested in folk music. In the parade ring before the Donkey Derby. The two gatemen pictured are Jarlath Connolly and the late John Joe Brennan. 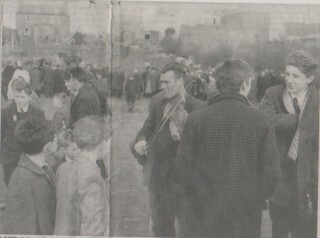 Another Milltown Races scene from the early 1960s. Spring was in the air last week, adding zest and increased enthusiasm for the Cheltenham Festival of National Hunt Racing – the Olympics and World Cup of steeplechasing and racing over hurdles. They travel from all over the world to the famous Prestbury Park racecourse for four days of top-class, fiercely competitive horse racing and millions watch it on television. It’s always magnificent sport, in the beautiful setting of a natural amphitheatre under Cleeve Hill in the Cotswolds, in Gloucestershire. At this time of year, I always think fondly of the local “Cheltenham” of my happy childhood days: Milltown Races! When I was eight or nine years of age, in the late 1950s, I discovered the excitement, thrills and spills of that great rural West of Ireland annual event, every Easter Monday, coinciding with the start of the local Carnival of Dancing and Fairground Amusements, one of the biggest of its kind in the booming showbands era. Like the real Cheltenham, there was also a lovely pastoral setting for Milltown Races (as can be seen in photographs taken in the early 1960s), on the Banagher side of the village and close to the sinuously meandering River Clare. In earlier times, Milltown Races had several changes of venue. 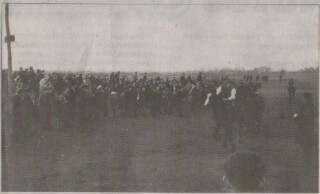 As recorded in Christy Molloy’s splendid Milltown Sketches (published in 1995) there was horse racing in Dalgin (on the Dunmore side of Milltown) as far back as 1840 “organised by the local gentry.” A Challenge Cup was put up for competition by William T. Bodkin Esq., with the entries made to Clerk of the Course Thomas Gibbons on the previous day, at Kelly’s hotel, Dunmore. Mr Bodkin was also a race-day steward along with Michael Blake Bermingham, John Bermingham and Arthur D. Bell. On March 17th 1877, racing took place at a new venue: leading businessman Martin McDonnell’s big field (now Frank Glynn’s) in the heart of the village. It was advertised as The Milltown Steeplechases, under National Hunt rules, on an all grass course, three races:the Milltown Plate, the Dunmore Plate and the Consolation Plate. Stewards: John Bermingham, Martin McDonnell, PJ O’Loughlin, Arthur D. Bell. Judge and starter: Yelverton Leonard. Treasurer: Mr D. Flannery. ” A procession of Toft’s many wagons, horse-drawn in the early years and later motorised, arrived in Milltown a few days before Easter. By Sunday, the hobby horses, swinging boats, shooting gallery, roulette table and many other sideshows were set up adjacent to the village pump. As people emerged from 11.30 Mass on Easter Sunday morning the lilting music coming from Toft’s organ heralded the opening of the Carnival. Toft must have been the first to bring light classical music to Milltown!” The fun-fair amusements attracted large crowds on the Sunday but the really big day was Easter Monday. Excursion trains brought hundreds of racegoers and day-trippers to Milltown Railway Station, across the road from the legendary Blue Pig pub on the town side of Pollaturick. They came from Westport, via Claremorris and Ballindine, and from Dublin, via Athenry, Ballyglunin and Tuam, picking up many passengers on both routes. Every other way of getting to the Milltown Races was used by people from Dunmore, Garrafrauns, Irishtown, Crossboyne, Kilconly, Kilbannon, Belcare, Corofin, Annaghdown and Abbeyknockmoy. The organising committee’s veteran president Pa Meehan came in for praise in the newspaper report, and there was a special mention of the important contribution to the day’s entertainment made by Tuam Brass Band, led by bandmaster Danny Kelly. There was another break from racing in the emigration-ravaged 1950s but a new era dawned in ’57 at a new venue, on fields behind Ryan’s, the Garda Barracks, the Church and Mannion’s with wide openings in the stone walls for the horses to pass through all full speed. On the other side of the river, on the same Easter weekend, the new Fr Conroy Memorial GAA Park was officially opened on the Sunday (April 21), along with a children’s fancy dress parade through the village and Carnival dancing in the marquee that night and again on Monday night after the races. Pony Race (12.2 hands). 1st, M Prendergast, Kiltulla, Athenry (“Lady”); 2, R Welby, Oughterard (“Bold Boy “); 3, John Rhatigan, Knock, Milltown (“Brown Girl”). Banagher Plate (open). 1st, JF Caden, Crossmolina (“The Joker”); 2, C Hunter, Newtownstewart, Co Tyrone (“Bonanza); 3, T McCarthy (“Belmullet”). Consolation Race: 1st, T McCarthy’s “Peacetime”; 2, C Hunter’s “Bonanza”; 3, T McCarthy’s (“Belmullet”). 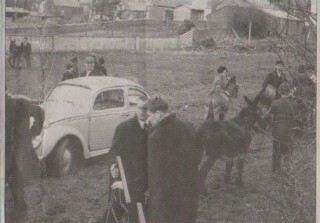 Donkey Derby: 1 st, Tony Gilligan, Kilmore, Tuam (“Cooley’s Pride”); 2, M Burke, Kilgevrin, Milltown (“April Rose”); 3, J Connolly, Ardnagall, Milltown (“Ballymahon”). The officials on duty at the racecourse included: Willie Burke (Chairman), Frank Glynn (secretary), Padraic Flannery (treasurer), Tom Malynn(judge), Michael Diskin (starter), Jarlath Connolly and Committee memberers Joe Ryan, Christy Grogan, George Garvey, John Joe Brennan, Luke Hehir. There are no official results available to show that racing took place after 1966, nor any newspaper reports, so we must take it for granted that the final year of the Milltown Races was ’66. It was felt locally at the time that the rising costs of public liability insurance could not be met, and it was also unfortunate that very bad weather kept attendances down in 1965 and ’66. And it may also have been a factor that-as Bob Dylan had told us a couple of years earlier-the times they were a-changin’. For the record, Cork man Michael Burns made the long journey to North Galway profitable when he saddled 1st & 3 rd in the big race in 1966, the £50 Milltown Plate, with a horse brought from Kilrush, Co Clare by John Reidy the runner-up, Another Clare man, Jack Murphy, saddled the winner of the Banagher Plate, and the Pony Race prize was kept local by the victory of the appropriately named Easter Lily, owned by the late Mattie Slattery from Ballymara; 2nd John Walsh, Claremorris (“Stylish Boy”); 3rd Gerard Foley, Clare ( “Clare Girl”). Special thanks to Peter Brennan from Liskeavy, Milltown (now living in Doughiska, galway) for very kindly offering his Milltown Races’ photos for this happy trip down Memory Lane; they were taken in the early 1960s, a few years after Peter had played in goal for Milltown in the 1960 County Minor Football Championship final. 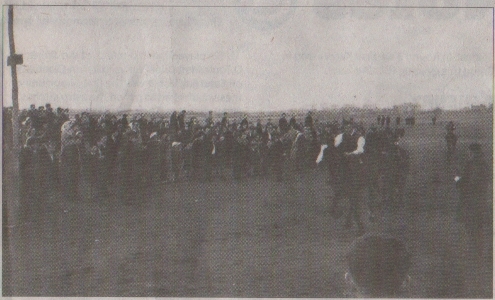 I failed to find out who took the photograph of the 1915 Milltown Races but it is great to have it.